This family-friendly hotel offers large rooms with balcony and free parking. It is a 15-minute walk or a direct tram ride from Leipzig’s city centre and central station. All rooms at the Days Inn Leipzig City Centre have a private bathroom, satellite TV and free Wi-Fi internet. Rooms are at least 27 m² in size and children can stay for free in additional beds. 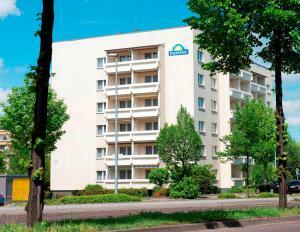 The Days Inn Leipzig City Centre offers a large breakfast buffet each morning. Drinks are available from reception 24 hours a day. Gerichtsweg tram stop is a 2-minute walk from the Days Inn Leipzig City Centre.